Merk Insights - Coming Out, As a Bear! Increasingly concerned about the markets, I’ve taken more aggressive action than in 2007, the last time I soured on the equity markets. Let me explain why and what I’m doing to try to profit from what may lie ahead. I started to get concerned about the markets in 2014, when I heard of a couple of investment advisers that increased their allocation to the stock market because they were losing clients for not keeping up with the averages. The media has touted quotes of me saying things like, "Investors may want to allocate at least 20% of their portfolio to alternatives [to have a meaningful impact on their portfolio]." The context of this quote is that because many (certainly not all!) alternative investments have a lower volatility than equities, they won’t make much of a dent on investors’ portfolios unless they represent a substantial portion of one’s investment. Sure, I said that. And I believe in what I said. Yet, I’m also embarrassed by it. I’m embarrassed because while this is a perfectly fine statement in a normal market, it may be hogwash when a crash is looming. If you have a theoretical traditional "60/40" portfolio (60% stocks, 40% bonds), and we suppose stocks plunge 20% while bonds rise 2%, you have a theoretical return of -11.2%. Now let’s suppose you add a 20% allocation of alternatives to the theoretical mix (48% stocks, 32% bonds, 20% alternatives) and let’s suppose alternatives rise by 5%: you reduce your losses to -7.96%. But what if you don’t really feel great about losing less than others; think the stock market will plunge by more than 20%; and that bonds won’t provide the refuge you are looking for? What about 100% alternatives? Part of the challenge is, of course, that alternatives provide no assurance of providing 5% return or any positive return when the market crashes; in fact, many alternative investments faired poorly in 2008, as low liquidity made it difficult for investors to execute some strategies. Historically, it’s difficult to say when markets top, when bubbles burst. In my analysis, relevant is the rise of volatility, i.e. the return of fear. With hindsight, we will attribute that fear to a specific event, but to me, it’s secondary whether it is concerns about China, Greece, the Fed, Ebola, or what not. Remember that the market has been climbing a wall of worries? Well, similarly, the market can fall on good news or bad news. The question is what will get investors to think the glass is now half empty rather than half full. Valuation. We don’t think stocks or bonds are cheap. We list this last, as everyone has his or her own preferred measure of valuation (in bull markets, investors are very creative in how they justify valuations). All I would like to add here is that any pundit that tells you "stocks can go up 10% from here" has no clue what he or she is talking about - in my experience, that’s what pundits say if they have stocks to sell. The biggest argument - and one I take very seriously - as to why none of the above means the market is going to fall is that the above points are rather obvious. The question is when will the market start to care about any or all of the above. Note that I believe the Fed will raise rates, but will "remain behind the curve." That is, we believe the Fed will be rather slow in raising rates, keeping real rates (i.e. interest rates net of inflation) near zero, if not negative. The Fed is well aware of past "temper tantrums" which contributes to its reluctance to raise rates. As such, it’s well possible that risk premia may not expand rapidly, thus keeping complacency alive and well. However, my base case scenario is that the Fed’s gradual approach will still get risk premia to rise, thereby toppling the markets. 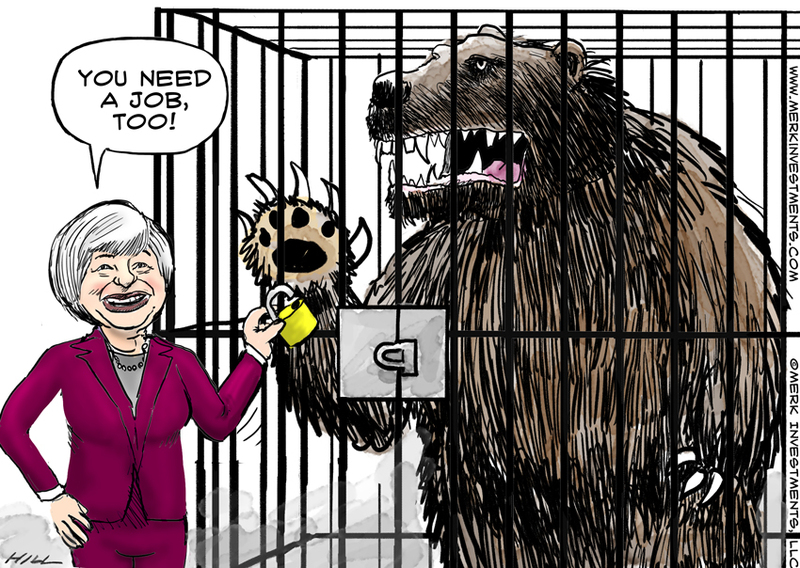 More so, Fed Chair Yellen has not experienced a major correction as Fed Chair; as such, she may well be late to succumbing the pleas of the market to back off. But given that much of the recovery may be based on Fed induced asset price inflation, a deflating of asset prices may cause significant headwinds to economic growth. As a result, I expect volatile Fed policy going forward; a Fed insider would more likely call it "fine tuning" of policy rather than volatile - you choose. Talking about out of favor stocks, I have recently bought some gold miners. Again, just like anything else in here, this isn’t an investment recommendation. Importantly, gold miners come with their own set of risks - they are certainly not safe. Beyond that, I have dedicated much of what I have available to invest to my home turf, the currency markets. The beauty of the currency market, in our assessment anyway, is that one can design a portfolio that has a low correlation to other asset classes. In a "long/short" currency portfolio that takes a relative position of, say, the Swedish krona versus the Euro, the returns generated are highly unlikely to be correlated to equity returns. That’s exactly what I’m looking for. And as the liquidity in the currency space is high, I don’t have the same fear I would have with many other alternatives. As always, I’m putting my money where my mouth is; amongst others, as a firm, we have built out our infrastructure, so we can offer long/short currency overlay services to institutional investors; we think that if/when markets plunge, they’ll be scrambling to learn more about services such as the ones we have been building. Of course there are other alternatives. They all have their own pros and cons, they have their own risk profiles. Note that there’s no easy answer should this analysis be right. And there’s certainly no assurance I’ll come out as a winner. But I firmly believe that just as former Fed Chair Bernanke talked about his toolbox, investors should consider having a toolbox. I’m ready for a bear market. Are you? To continue this discussion, please register to join us for our Webinar on September 17. If you haven’t already done so, ensure you don’t miss it by signing up to receive Merk Insights. If you believe this analysis might be of value to your friends, please share it with them.